• This Elegant gift assortment is a healthy yet tasty gift wrapped beautifully by our Nuttery designers. • These dried fruits have all been hand selected and packaged in our state of art facility, and will provide the perfect message you wish to relay to the recipient of this gift. • All the fruits are kosher certified and are backed by our 100% SATISFACTION GUARANTEED. ABSOLUTELY NO QUESTIONS ASKED POLICY!! 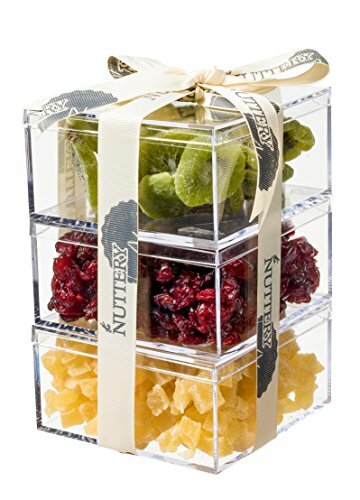 The Nuttery offers a variety of confectionery delights and dried fruit, all made in-house in their New York based nut & confection studio. From freshly roasted macadamia nuts to our exclusive praline chocolate logs - each offering is a confectionery perfection. Nuts are roasted in the shop using exclusive equipment and the finest ingredients. If you have any questions about this product by The Nuttery NY, contact us by completing and submitting the form below. If you are looking for a specif part number, please include it with your message.